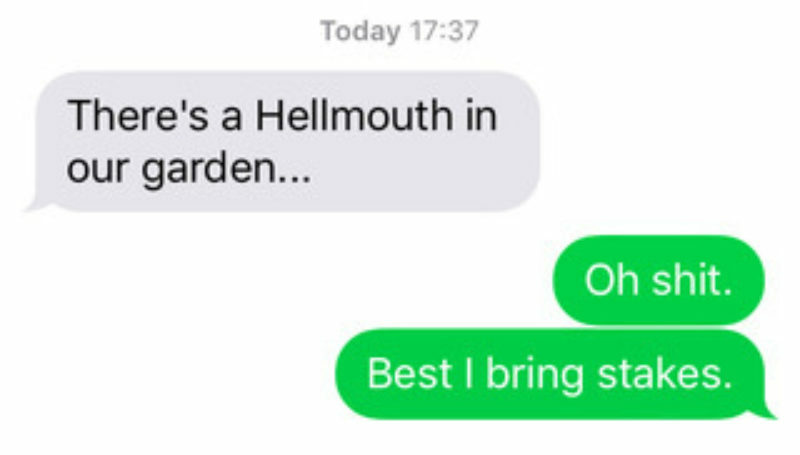 You never expect the text that tells you about The Hellmouth, even when you’ve been an ardent Buffy fan for a lifetime. It winked onto my phone a month ago, on a quiet Sunday afternoon when I was dreaming of future dahlias (I’m always dreaming of future dahlias). Of course, it wasn’t a Hellmouth full of über-vamps at all, but the base of a row of stables, from when my garden was a haulage yard whose horse-power was, well, horses. Doc had been minding his own business riding the mini-digger like a rodeo victor (in my imagination, if not quite in practice) when he noticed this cavern open up perilously close. Its emergence has created a long hiatus in our skirmish with the garden design, while we wait for more hard-core. We moved into Sunnyside, as our falling-down house is fancifully called, in April 2016, and became the custodians (profoundly amateur, committedly fair-weather) of a large garden that had been mostly untended for a decade. There was a 1960s rustic stone pond, a dilapidated glasshouse, a large-but-shady border, and weeds beyond the dreams of mortals. This is the first of a series of columns—a series of stories if you like—about our garden renovation. We progress slowly, with a tiny budget and eyes much greedier than our budget permits. Each column will focus on something seasonally relevant (next month: The Firework Border for a cunning Bonfire Night tie-in), and along the way you’ll meet my husband (who prefers to remain nameless) who does the heavy landscaping, and my favourite plants, who bring the glamour. I first started growing things in childhood—cress on a damp handkerchief—but I’m very definitely an amateur, spending most of my time on my day-job of making and teaching art. 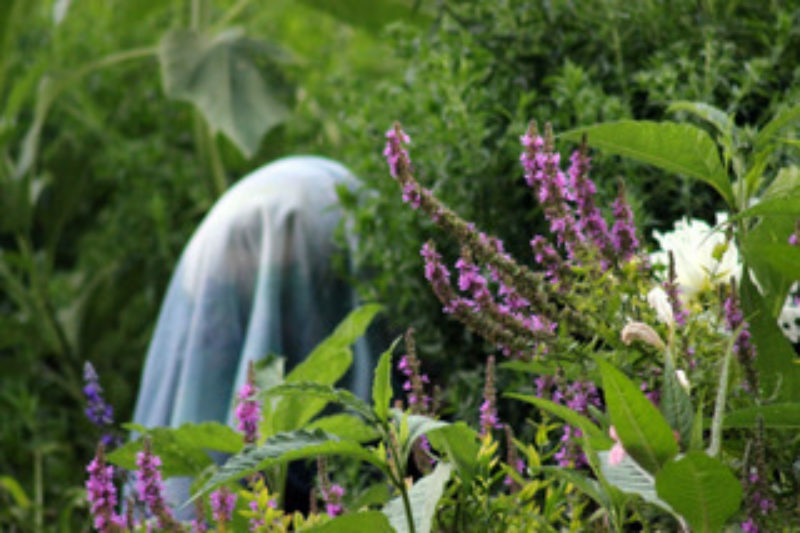 The two things started to become connected for me during my 2011 residency in Giverny, when I spent nights alone in Monet’s garden, and camouflaged models in gift-shop tat among the glorious borders. Here, you’ll find a lot of garden, a little art, some reading recommendations, some possible viewing. Learning that professional garden-designers suggest observing the garden for a year before making any significant moves, we did exactly that. We discovered greengages and a sour cherry, apples, gooseberries, blackcurrants, waterlilies, rushes, mint, crocus, tulips of the upright red-and-yellow type, an enormous peony that we promptly called The Beast, honeysuckle (yellow and white, red and yellow), twenty-five roses with black-spot, the headiest purple hyacinths, holly, a patch of forty autumn raspberry canes, a Virginia creeper that dandles over the pigeon shed that will one day be my studio, water irises, gladioli, daisies, hebe, valerian, everlasting (unscented) peas, and a magnificent painting of a white duck the size of a dalmation. There were aphids; a vast, slithering slug colony; lots of cabbage white caterpillars; a bee nest; a family of pert wrens (and other birds); a neighbourhood of cats and the finest blackberries I’ve ever tasted. The Glasshouse (which makes it sound much grander than it is, it’s a cobbled-together affair) is the hub of everything that happens in the garden. Project One was the initial Glasshouse renovation: grubbing up and re-laying the floor, cleaning out, removing old potting benches and replacing them. I moved in straight away with my seedlings and my chillies, my allotment box of seeds, a car-load of pots that were generously donated by an emigrating friend. In 2017, I grew peppers and aubergines, overwintered my first dahlias, sowed lupin seeds left over from my visit to Chelsea Flower Show a decade earlier (they germinated! ), scoffed tomatoes, and hid lilies from the lily-beetles. This year, it’s been home to lettuces, beets, carrots, tomatoes, peppers and new dahlias. During the long dry spell that central and southern England experienced, we flung open the windows in an attempt to generate some breath of air. The plants took a battering though. Then they took a battering again as the whip-tail of a hurricane whisked through, felling my hollyhocks, and smashing several of the windows, rudely tipping my precious dahlias in a scatter on the floor. Our much cherished Mirabelle plum didn’t survive, and my plans for the Mirabelle trifle are dashed for now. Now we are at The Hellmouth, and the beginning of a long autumn of structural work. Soon we will lay curving paths (the sledges are already in place), and a deck with built-in seats (something we learned from our last garden). We’ll bridge the pond, build raised beds, and a circular seat, improve the soil in the shady-bed-that-kills-everything, plant bulbs and bare-root roses. And every Sunday until spring, I’ll tune in to the #FlowerReport on Twitter, where the beauty of persistence and the persistence of beauty are celebrated, and we revel in the blooms of others, when ours are in short supply.